The RMG provides a modern and elegant venue, with an artistic twist, to host your wedding reception. From intimate gatherings, to larger ceremonies, we look forward to helping you plan your special day! From event planning and coordination, to food and flowers, to décor and styling, let us help you plan the perfect wedding day for you and your guests! 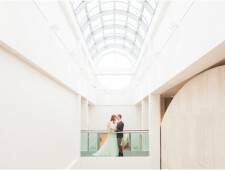 The RMG has been host to a variety of themed and stylized weddings over the years and we look forward to ensuring that every detail of the day is how your imagined it would be. Contact us to start planning your wedding!